#life lately: EP 8 first of all....!!!!! 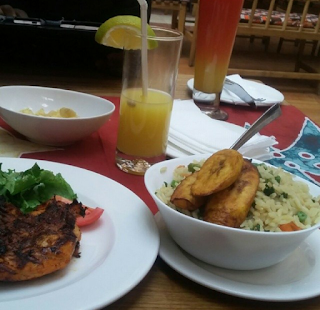 Hi my name is Cynthia Osigwe ( the stylish doctor) I am Nigerian and i love jollof. lol!!!!!! Am actually in a good mood..... Why wouldn't I be???.... the lord has been so merciful and gracious to me. So I was seriously ill thats why i couldnt put up any post ( when the doctor becomes a patient). I don't fall sick often, in fact I haven't in years , so it was almost like a new feeling for me lying down not being able to help myself and taking drugs. But am much better now. While I don't ever want to fall sick again let me share with you a few things I learnt in the course of my "hiatus"
1.Doctors make the worst patients . 2.Health professionals should pay attention to their own health as well. Sometimes we get so busy taking care of patients that we ignore our own wellbeing. 3.Good friends cannot be bought, they are special gifts from God. If you have such friends you are blessed. 4.Life is precious,good health is a blessing never take it for granted. Everyday you wake up hale and hearty be grateful. 5.you owe yourself the exclusive right to be happy. Make everyday count. Expect More posts "back to back" to make up for the long absence. What do you hate most about being sick? Feel free to leave a comment below . First you just had to tempt me with the site of good food, is that fair? Thank God you are better now, no one deserves to be sick. Well apart from malaria (which they "Doctors" tell us we have almost everytime we visit the Hospital even if we only came because we couldnt feel our big toes) I dont usually fall sick. Bt the few times l have been sick l think what l hated most was the constant bitter taste I had in my mouth (which made eating more of a work than fun) and the pounding headache. Infact in one sentence, what l hate most about being sick is being sick. Lol! I totally agree with you,the pounding headache is the worst!